Have you paid good money for your SSL certificate but now find that the http version of your site ranks in Google SERPs? 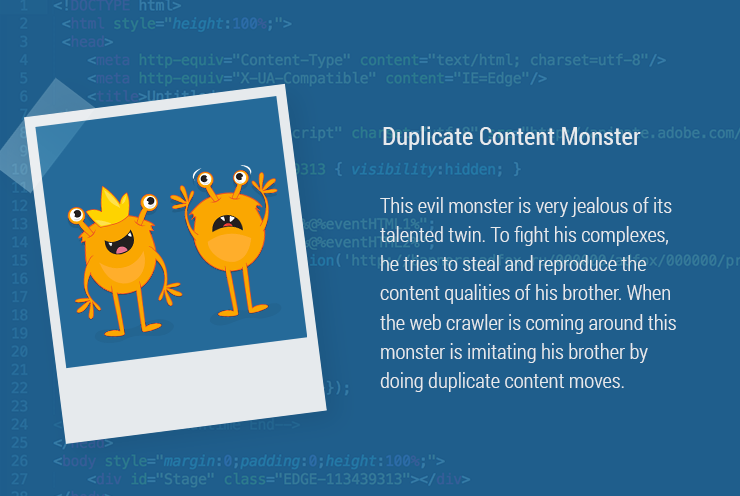 The reason for this debacle could be the inconspicuous Duplicate Content Monster. We will show you in just a few steps how to quickly identify and deal with it! Similar content, which can be found under different URLs or domains, are referred to as Duplicate Content. Duplicate content makes it difficult for search engines to provide the user with the best and most relevant search result because they have to choose between different versions. Website owners should, therefore, aim to produce unique content. This minimizes the risk of duplicate content. The canonical tag is a meta-element in the area of a website that allows you to point search engines to the original URL. Search engines then usually index only this “canonical URL” and ignore the copy. If you want to avoid indexing a page with duplicate content, insert the tag on this page and enter the link to the original URL. Deichmann does everything right in the source code. Both URLs point to URL 2 by means of the canonical tag, thereby indicating to the search engine that this is the original URL. Figure 2: Extract from the source code. Duplicate content can waste valuable potential. Therefore, it is not only important to reduce the number of duplicates, but also to establish the necessary technical requirements. The canonical tag is a quick fix to prevent duplicate content. It can and should be used selectively, but in no case should it be used to solve duplicate content on a large scale. Despite Canonical tags, search engines have to analyze the corresponding URLs to see the canonical tag. This process can hugely waste crawler resources where there are a large number of affected sites. Therefore, you should always try to avoid duplicate content. Google recommends avoiding content that is accessible under multiple URLs through the website structure. This avoids the creation of duplicate content and saves on the crawl budget. Ryte enables internal duplicates to be detected in just a few steps. 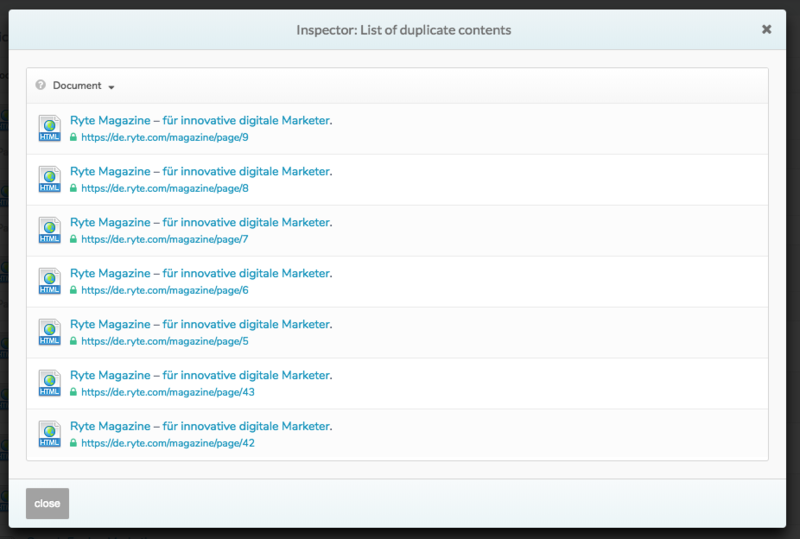 In order to do so, select the “Content” → “Duplicate Content” → “Duplicates” report from the Zoom module. The report lists all the duplicates found by the crawler on the web page and how many duplicates the affected URL has. Clicking the magnifying glass in the “Duplicate counter” column displays all duplicate content URLs. The different colors represent the various degrees of optimization. Red means there is still a lot of potential for improvement. Yellow bars contain URLs that do not have such an urgent need for optimization, and green means that everything is fine. The number of duplicates are also shown next to each bar. Click on the magnifying glass to see information about all the duplicates associated with the page. Now all duplicates are listed for the pre-existing original. In this case, optimization is required due to the very high risk of duplicates. Duplicate content is not a reason for Google to penalize a website, but duplicates nevertheless waste an enormous amount of potential. The above-mentioned tips enable you to avoid duplicate content and tap this potential. Published on 05/30/2017 by Eva Wagner.